Editordude: the OB Rag has experienced a resurgence of interest around Sheldon Dorf, OBcean and one of the founders of Comic-Con, and the history of Comic-Con; we repost the following article about Sheldon, originally posted on July 21, 2017. 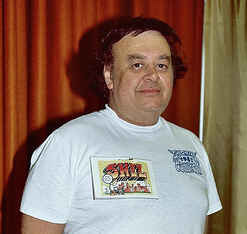 Sheldon Dorf was one of the founders of Comic-Con and he lived in Ocean Beach for many years. “Shel” was living in OB when I met him in the mid-1970s. He passed away at the age of 76 in 2009, but now he’s a key focus in a current Rolling Stone article, entitled “San Diego Comic-Con: The Untold History” by Chris Chafin. Many of the founders [of Comic-Con] would go on to successful careers. Barry Alfonso … Mike Towry … Richard Alf … Scott Shaw … For Dorf, things were less smoothly. In a cruel bit of irony, the man whose primary asset was unabashed fandom and an ability to connect fans with creators – skills which he used to help found the most successful fan convention of all time – lived the bulk of his life feeling slighted by his creation and jealous of the younger people who found the creative and professional success he never had. My Mother was Shel’s next door neighbor for almost 30 years. They both lived alone, in small cottages on Abbott St., and my Mom always made mention of how thoughtful Shel was. I would visit my Mom often and Shel would always give me a polite hello. It’s nice to see him remembered. Thanks O.B. Rag. The early years of Comic-Con were so different, but still wonderful. I saw Sheldon Dorf around but didn’t really know him. I was lucky to know two cartoonists that were very active in the Comic-Con in 1975-1976. They were Dave Stevens, creator of the “Rocketeer”, and John Pound Creator of “Howard the Duck”. I met the two of them while I was taking a ROP Applied Arts Occupation Class during high School. Both these talent men helped out in class and inspired many of the students. Stevens did his first ink sketch of the “Rocketeer “ while he sat next to me as we were talking. I was so excited years later when Disney did the Rocketeer movie! The comic-Con at that time was in the El Cortez Hotel. There were about a dozen tables including a Star Trek table. I was able to sit around and talk with the artists for hours. Sadly, Stevens died in his early fifties. Pound moved to Oregon and that is the last I heard about him. My husband Ray (a cartoonist/animator) gave me a Rocketeer doll and book a few years back. These bring a flood of memories back of the Comic-Con in the early days. Hats off to Sheldon Dorf and friends for bringing us the Comic-Con. Sheldon Dorf was my father’s first cousin. He was always a caring and loving person. When I attended UCSD, I visited him often. I remember the preparation he put into the first few conventions. He very much enjoyed his work, which was lettering for comic artists like Milton Caniff (Steve Canyon). He also had the ability to do some artwork. The family strongly adored him, and misses him.